The world of SMS marketing initially tends to be overwhelming to any newcomers. There are so many options and ways to go about becoming a marketer, that people seem to become nervous when they are shown all of the numerous choices they have available to them. The answer to that question, however, is not as simple as one may think. It’s not complicated because becoming a reseller is complicated. It’s complicated because there are so many benefits and opportunities that surround becoming a reseller, that we typically don’t know where to begin! Here is a breakdown of just a few reasons why you should become an SMS reseller. In terms of what kind of media outlets marketers can use to reach audiences, SMS will always be the most successful for a number of reasons. When an advertisement or message is sent out to such huge groups through things like social media or even email, things tend to get lost in the shuffle. With SMS, your message will always be opened and well received by any audience. Without a doubt, SMS has become a way of life to an overwhelming majority of people throughout the world. The outlet of SMS may be proven to be successful, but that doesn’t mean that becoming an SMS reseller isn’t an intimidating thought. Getting into the actual business end of becoming a reseller can be unnerving at first. The thing is, once you get past all of the fears that go along with any business investment, you will be able to see all of the possible opportunities that come along with it. After you choose the best reseller program for you and your needs, things will start to get easier and less intimidating almost automatically. While their may be certain limitations in becoming a reseller, there is an endless amount of possibilities that will always outweigh them. 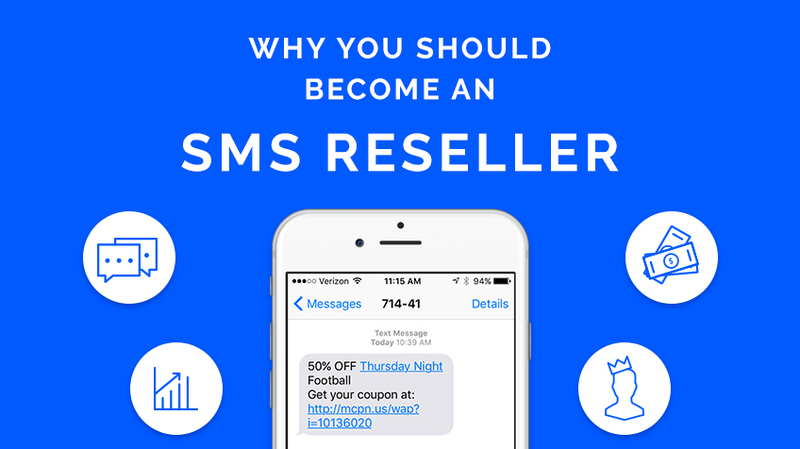 Overall, becoming an SMS reseller is an investment in your future. Any investment is scary, but you have to take that risk in order to succeed in the long run. Once you sign up to become an SMS reseller, you will almost automatically start to see an additional revenue stream open up on a monthly basis. After you sign up your first client, you will begin to see monthly residuals coming in. Sooner or later, you will have multiple clients and those monthly residuals will begin to grow before your very eyes. Something important to keep in mind is that the more features you have to offer to your clients, the more money you can charge them per month for your services. That is why you need to choose a platform that is the most robust in terms of its features. This will bring your monthly income to an even higher amount. When it comes to investments and starting new businesses, ROI is one of the most common terms used throughout. Whenever an individual invests their own money into any kind of business opportunity, they tend to get very nervous when it comes to their return on investment. In the realm of becoming an SMS reseller, however, the risk is not as high. Depending on the reseller program you sign up for, your monthly fees versus how much you will actually make will always be less as long as you charge the right amount to your clients for your services. You just have to make sure that you provide enough incentive to your clients as well as to their customers. Incentive is a major key when it comes to ROI. At the end of the day, we can list a million and one reasons as to why you should become an SMS reseller, but the best reason of all is that you get to be your own boss! When you become an SMS reseller, you get to make all of the decisions moving forward. If you choose to become a white labeled reseller, everything will be done at your own discretion under your own brand. The fact that you will be under your own brand will add to your own marketing and revenue as well. Being your own boss enables you to maintain your brand and promote it however you’d like. When you sign up for any reseller program, you future is truly in your own two hands.